Since Roman times an important road of communication, the Via Claudia Augusta, led from Italy over the Alps to Austria. A defensive fortress on the site of today’s Castel Brando helped protect this road. Indeed, an original castrum, or Roman fortress, dating from 46 AD still exists, and within this archaeologists have uncovered a bread oven from the same period, and the original pipes of an aqueduct which brought water to the settlement from three nearby springs. These springs still supply water to Castel Brando. During the Barbarian Invasions the castle played an important defensive role, as well. From 1233 to 1335, the noble Da Camino family added battlements and a central tower. The famous Italian feudal lord and military leader, Gherardo III da Camino, was born in the castle in 1240. The Republic of Venice eventually took over the ownership of the castle and awarded it as a fiefdom to Giovanni Brandolino. His descendents enlarged the castle and added the Venetian Gothic double and triple mullioned windows and the chapel. 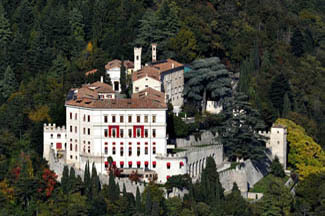 The Brandolini family had to temporarily abandon the castle during World War I when the Austrian army took it over and turned it into a military hospital. In 1959 the family sold the castle to the Salesian Brotherhood, who established a monastery on the site. Forty years later the castle was sold once again to begin a new life as a hotel and museum. I always recommend staying inside the original castle if at all possible, and that holds true here. You want the medieval atmosphere and the fantastic views that Castel Brando has to offer. You’re only an hour away from Venice, so if you want to get away from the crowds, relax for a few days, and experience a different side of the region, this makes a great choice. Cison di Valmarino is about 70 km from Venice. From the Venice-Belluno A27 motorway, exit at Vittorio Veneto Nord and follow the signs to Follina and Valdobbiadene. After 12 km Cison di Valmarino will come into view. The nearest train station is at Congliano Veneto--23 km away. From there take a taxi. Yes. Inquire hotel for more information. Castel Brando is a wonderful example of what you can do with a large, imposing castle in the 21st century. Under the watchful eye of the Historical and Cultural Heritage Ministry, the castle has undergone a restoration true to its original spirit, while at the same time making life for today’s guests as comfortable as possible. Decorative battlements, tapestries, suits of armor, and swords are reminders of a long-ago era while you walk the hallways. Take an elevator to your air-conditioned room and you’ll wonder how the early medieval residents lived here without such conveniences. Guest rooms may be found in different wings of the castle, which is comprised of nine levels. Some rooms can be small and some spacious. Each is uniquely decorated in period style and have views of the hills, valley, or inner courtyard. A few of the junior suites feature fireplaces and ancient stuccoed walls. Bathrooms are modernized. Still part of Castel Brando but located down the hill is the Villa Marcello Marinelli. Overlooking the main square of the village, this annex holds 14 guest rooms decorated in a period country style with exposed wood beams and wood floors. Rooms with kitchenettes are available. The Dependance is a large stone cottage that sits right in front of the entrance to the funicular. Its 16 rooms are modern in decor. For a elegant dining, try the Sansovino restaurant, or if you’re in the mood for something casual, La Fucina serves up large pizzas. Both are located inside the castle. You’ll also find a bar, wine bar, and wine cellar tucked away in some of the castle’s most atmospheric spots. Enjoy live music on the weekends. Highly recommended, too, is to take the funicular down to the village for dinner. You’ll see your castle brilliantly lit up on the hill above you.